Welcome to a new series on my blog – The Monthly Wrap Ups! 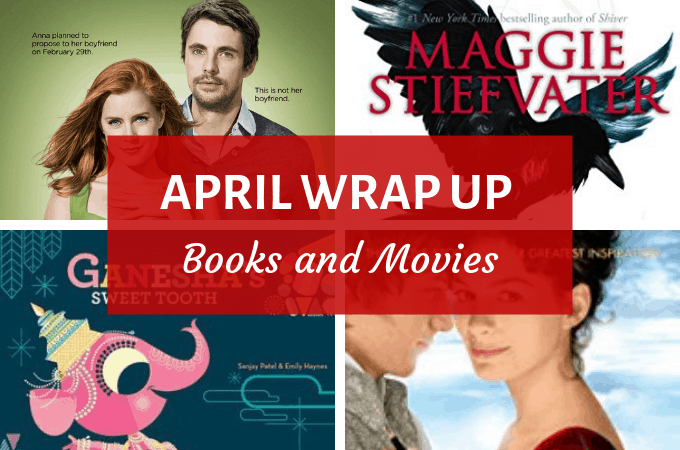 This is where I wrap up my month in books and movies – typically within the first week of the next month. 1. To get book and movie recommendations out to you guys on a regular and timely basis. 2. To ensure that I stay current with my reviews. I have a horrible tendency of falling behind and never catching up if left on my own schedule. But I am pretty anally retentive of schedules and routines that I commit to publicly, so I am hoping this will help me to stay on top of my game. 3. To keep a track of what I am/was reading when. I am sure something like this only interests the very-nerdy folks like me, but hey whatever floats our boat, right? These are the books that I read in the month of April (I am not including the ones that I started but did not finish in the month; will include them in the month I finish them). I can’t really explain why I picked this book. I happened to read a teaser/blurb of the book, and could not put it out of my mind. It did not matter that it was in a genre that I do not typically read (paranormal) or the fact that YA is pretty hit or miss with me these days. I know, there is nothing amazing/spectacular about those lines, but I couldn’t stop thinking about them! And I have no idea why! 1. This whole thing might not end well as the guy will most probably die (This is NOT a spoiler – you will figure it out in the blurb/read about it in the first few chapters itself. 2. There might be ghosts involved (and if you know me, you know I don’t do well with them). Nonetheless – I read the book, and I am SO glad I did; never mind the fact that I had trouble sleeping some nights (note: it’s not really scary for normal people, my ghost/paranormal tolerance is low to non-existent). There is a lot to love, but I must begin with mentioning the unique plot, featuring slumbering welsh kings, talking trees in a magical wood where time is merely an illusion, tinged with the frightening dark beauty of centuries-old magic – all tackled by a cast of 4 high-school students and 3 psychic women. Add to that – a complex narrative, well fleshed out characters, and an utterly haunting style of writing – this story has all the right ingredients. Having said all that, I must say that the first half of the book is pretty slow paced. Not that I had an issue with it – I did not mind the pacing and the flow at all, mostly because the first book in a series typically involves a lot of world building and atmosphere setting, and I am completely okay with it. But some people might be put off by it, and hence I need to mention that things do get better; the plot picks up and you will not regret continuing with the book. Also, from the blurb I suspected this is essentially a romance, but there is hardly any romance in this book (which is A-okay for me), and even in Book #2 (which I am currently reading) there is very little romance (though it hints at a future romance). Overall: The strength of this book lies in its unique plot, complex narrative and extremely lovable characters. I would highly recommend it to people who enjoy the genre. P.S. I will have a spoiler-free series review up once I finish the series (Update: HERE it is!). This is a kids picture book that I read (to my son) in April and both of us adored it. I have done a full review/rave on it over here. But essentially, this one is a fantasy folklore, which is loosely (very loosely) based on Hindu mythology. 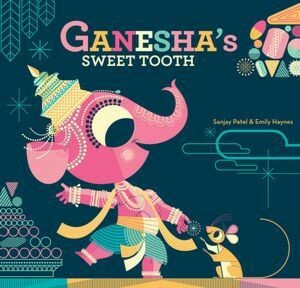 It’s a charming and engaging tale, with wonderfully colorful and whimsical illustrations; perfect for ages 3-8. This book managed to keep my usually-very-distracted 4 year old completely hooked from start to finish (speaking of which, you can get through the entire book in under 10 minutes) and that is a big positive in our world. Bottom Line: If you have a child in that age group – get it; you will not regret it. It also makes a great gift for kids in that age range. Okay, here I am taking some liberties by including movies that I saw in March, but hey – it doesn’t matter in the grand scheme of things, so whatever! It was an interesting co-incidence that I saw this movie on the eve of St Patrick’s Day – was totally clueless about the plot/setting/culture before selecting the movie – it just so happened to be the eve of St Paddy’s Day. And there is something quite inexplicably awesome about seeing the right movie at the right time – like Christmas movies are awesomer (not a word, I know) on Christmas Eve. Nonetheless – I could have seen this on any day of the year and loved it just as much. Mostly because, the biggest highlight of the movie (for me) was not the timing, but Matthew Goode (note: I am possibly unfairly biased) – I did not think much of him on first sight, but boy did he grow on me! However, Leap Year is a charming movie for many reasons – it’s a classic plot freshly retold with a lot of humor and heart; it’s set in Ireland, which makes it a visual delight.. and finally – Matthew Goode (did I mention him already? yes? never mind, he deserves repeated mentions). All in all – Leap Year is a sweet romantic comedy, perfect for anytime of the year. Highly recommend. With this movie – I broke one of my biggest “rules” of never seeing a movie before I read the book. In this case, however, I was not interested in reading the book; the trailer caught my interest, and I really like Anne Hathaway (and was overjoyed at her being cast as Austen), so I just had to watch it. Also, please note that the 5 stars are possibly very highly influenced by the fact that I had just finished reading (and re-reading), watching (and re-watching) several adaptations of Pride & Prejudice, and was nursing a huge woman-crush on Austen when I saw this movie. I hear that this film is based on a biographical work on Austen’s Life – if that is to be believed, then it also says that Tom Lefroy was Austen’s one true love, and that the character of Darcy is based on him – this I believe is deduced from the fact that Austen wrote Pride & Prejudice when she was dating Lefroy (I do not see the similarity between Darcy and Lefroy, but who am I to contradict Austen scholars?). How much of any of this is true? I have no idea; possibly – very little. But I would urge you to leave the debate of historical authenticity to Austen scholars, and see this movie for the charming characterization and visual delights of the English country side. Most importantly – watching this was like watching another one of Austen’s brilliant novels come to life, and what could be more fulfilling to an Austen fan than that? Highly recommend. Have you read any of these books or watched any of these movies? Any others that you have recently read/watched that you really enjoyed? Do share! The great thing about your ‘wrap up’ post is that it reaffirms that I’m all caught up with your posts. Even if I haven’t commented on them. 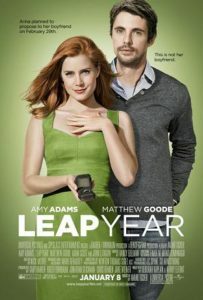 Leap Year is a fabulous rom-com, isn’t it? BEcoming Jane seems like a must see! Will check it out! THanks for the post! I clapped my hands like a big nerd when I saw you’d read and liked The Raven Boys. What a great book! I hope you end up liking the series as a whole — even though the first one’s kinda marketed as a romance, it’s really more of a book about friendship. So I love it for that. Oh yes! I love them all – some more than the others, but as a whole – I am in love with this series. I read the first 3 books so far and I wonder why this is marketed as a romance at all. Possibly something in The Raven King? Both the movies sound interesting. I will watch them. I have seen the Raven Boys at many blogs. Good to know you enjoyes it as I am also not so keen on fantasy, paranormal et al. I can only watch the Twilight movies. The new blog series idea is good and easy way to wrap up the month. I like. As far as Twilight goes, I own the entire series, but am yet to read it. It’s been with me for over a year now, but I keep putting it off. Maybe someday..
Manish Purohit recently posted…Chronicles of a Solitary Soul – Ubuntu . . . I am because You are !!! Glad your April Month was productive in terms of the number of books and movies. I’m wayy yyyyy behind that way. Hema recently posted…Short Fiction – Paint it Red! This wrap up is a good idea. I too am woefully behind in my reading. I will check your recommendations. Being Jane is high on the list. Great idea for a wrap up post! I don’t usually enjoy YA or paranormal either, but Raven Boys does seem interesting. Love Anna Hathaway too, hope I can watch the movie soon! I so gotta catch up with reading and movies! Did you catch the latest Captain America? Hehehe, I did! 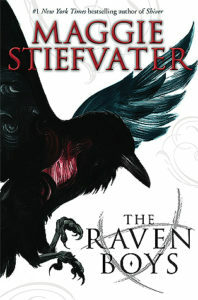 The Raven Boys sounds interesting, I am an equal scaredy-cat, but some books just catch the fancy or what! Becoming Jane does mighty tempting, but I think I’ll wait for it to come up on Romedy Now – our rom-com channel! I like this new format idea, keep it coming girl! Thank you, Kala. So glad you like this new series. 😀 And nope, haven’t watched Captain America yet. How did you like it? I love this idea of a wrap up post mostly because they are so newsy. I’mean glad you included the films. They all are interesting. Leap Year sounds lovely as does Becoming Jane. As for the books – I feel i’my drowning under my TBR. Since the kindle came I have started collecting ebooks too. The Raven Boys sounds so interesting. I’ve seen a ton of buzz around The Raven Boys. I can’t ignore it anymore! And thank goodness there is little romance in the plot. So over that. I missed so many of your posts since I did not get any update 🙁 I thought you had temporarily stopped blogging. I started reading Raven boys and then got distracted because of another book. Will pick it up soon. I havent seen both of those movies, will try to catch them soon.